Chris Van Zeyl (born September 4, 1983, St. Catharines, Ontario), formerly a Notre Dame Welland Fighting Irish in Welland. Chris is the starting right tackle for the Toronto Argonauts of the Canadian Football League (CFL). Chris attended McMaster University where he played 5 years of Canadian Interuniversity Sport (CIS) Football, twice an Ontario University Athletics (OUA) All Star and an All Canadian as a defensive lineman. In 2007 he was drafted in the third round, eighteenth overall by the Montreal Alouettes. While in Montreal he attended two camps and was asked to begin to train as an offensive lineman. On September 5, 2008 Chris was released by the Alouettes and acquired by the Toronto Argonauts. 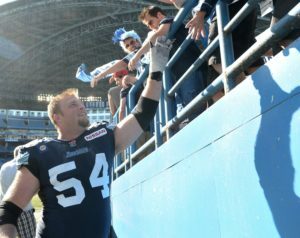 While on the Argonauts practice roster Chris continued to develop as an offensive lineman and was signed to the active roster on August 27th of 2009. On October 29, 2009 Chris made his very first start at right tackle and continued as the starter for the remainder of the season. Chris then won the job during training camp in 2010 and has been a starter for the Toronto Argonauts since. Over the last 8 seasons as a Toronto Argonaut Chris has played 123 games and was honoured as a CFL East All-Star 3 times (2013, 2014, 2016), CFL All-Star once (2013), a Canadian Football League Player Association (CFLPA) All-Star 3 times (2013, 2014, 2015) and the Argonauts Most Outstanding Lineman twice (2012, 2014). Chris Van Zeyl was a member of the Toronto Argonauts that won the historic 100th Grey Cup in 2012. After winning the Grey Cup, Chris returned to his roots and brought the trophy to the Niagara Region where he made appearances at the schools he attended; St. Alexander Elementary in Fonthill and Notre Dame High School in Welland. Chris would like to thank his parents, Casey and Betty Van Zeyl and his wife Kimberley for all of their love and support over the years. They have always been his biggest fans. If you have met Chris’ mom you probably have one of his CFL player cards. Finally, Chris would like to thank all of his coaches in soccer, baseball, basketball, hockey and football that, at a young age, put him on this path by helping to develop his work ethic and competitive spirit.